You are here: Home 2012 June Why Does the Nexus Core Switch Rock in the Datacenter? The Cisco Nexus core switching system is taking the datacenter by storm, and there are good reasons why IT professionals are making it the heart of their server and storage systems. The transition to densely virtualized servers with rapid access to shared storage has coincided with the ready availability of 10G Ethernet ports on servers, and these 10G Ethernet ports all have to be connected together with a high speed switching fabric. The Nexus switches have three main advantages that improve the reliability, speed, and flexibility of this switched network: Fabric Extenders, Virtual Port Channel, and Unified Fabric. Network Admins like to have all the servers connect to one or two main switches, while Server Admins like to have their servers connect to switches at the top of the rack. With traditional Ethernet switches, there are disadvantages to both architectures. Traditional End of Row (or Middle of Row) switching design creates monstrous patch cable tangles, while traditional Top of Rack switching leads to reliability and bandwidth issues. The ideal would be to have one or two switches that can be centrally managed, yet have extensions at the top of each rack for easy server connection. The Nexus switches have a unique design where remote Fabric Extenders act as remote shelves of the redundant core switches. Each Nexus 2000 Fabric Extender is controlled through multiple 10G copper or fiber uplinks by one Nexus 5000 or 7000 switch, with all management and switching decisions done by the parent switch. Each Fabric Extender can also have a secondary parent, creating reliability though redundancy. A typical deployment would have dual Nexus 2000 FE’s at the top of the rack for servers to dual-home connect to, and would have multiple uplinks to the Middle of Row or End of Row Nexus 5000 or 7000’s. This design creates a high speed and reliable core switching system with straightforward patch cable layouts. Datacenters that have multiple rows of server and storage racks are best served by having multiple logical layers of switches, with the traditional design being Core, Distribution, and Access. Servers, storage, and virtualization systems work best when the systems are all in the same Layer 2 organization. The problem is that Layer 2 loop control mechanisms have issues. For example, the most consistently reliable protocol, Spanning Tree Protocol, prevents traffic from traversing half the uplinks by design. That means in a traditional switching environment, uplinks from access to distribution layer switches do not have enough bandwidth, slowing the information transfer where it is needed the most. When possible, Port Channels are used to provide multiple parallel uplinks, but this only works to a single distribution switch, and does not scale well to larger environments. The Cisco Nexus architecture addresses this issue head on with the adoption of the Virtual Port Channel protocol. It is a special communication between redundant Distribution layer switches that allows for two switches to negotiate Port Channels with any type of Access layer switches. For example, if the Distribution layer was composed of two Nexus 5000 series switches, and the Access layer used existing Cisco Catalyst switches, you could set up Port Channels on each of the access switches, uplink them to both Nexus 5000 switches, and have all uplinks active all the time! Even better, with a setup of dual Nexus 7000 switches at the distribution layer, Nexus 5000’s and 2000’s at the access layers, all of the 10G links will be active with no loops or blocking. Fabulous! Data centers have traditionally operated a dedicated storage network. This means each server required Ethernet Network Interface Cards and Fibre Channel Host Bus Adapters. With the adoption of 10G Ethernet on the servers, IT administrators are evaluating other options. This has to be done in conjunction with storage array manufacturers because the arrays have to connect into the network somehow. At this point in time, storage arrays are offered with connection at 8G Fibre Channel, 10G iSCSI, 10G Fibre Channel over Ethernet, 10G ATA over Ethernet, and 10G Network Attached Storage. A dedicated Fibre Channel network has traditionally had an advantage for storage, because it was designed from the beginning to transport SCSI packets fast and reliably. Anything transporting storage over Ethernet has usually had slower performance because protocols had to be put into place to retransmit dropped packets. If the Ethernet network could provide high speed, lossless transmission of SCSI packets with low overhead, it could be a replacement for the Fibre Channel Storage Area Network. The Nexus Unified Fabric provides upgrades to the Ethernet network to enable high speed lossless transport of Fibre Channel information packets with low overhead through the use of the Fibre Channel over Ethernet protocol. This allows for the gradual elimination of the older and slower SAN. But no organization is going to go out and replace all their existing storage arrays with new ones that have FCoE interfaces on them. So the Nexus 5000 has a special feature that enables conversion from Fibre Channel to FCoE. The universal ports on the Nexus 5000 allows for any port to have Ethernet or Fibre Channel interfaces. Internally the Nexus Operating System (NX-OS) can map VSAN’s to VLAN’s, and will encapsulate the Fibre Channel traffic into Ethernet frames. To enable lossless transmission of storage at Layer 2 with low overhead, the Nexus switches are set up with Quality of Service to prioritize the storage traffic over all other traffic. This combination of features on the Nexus switches provided for a true datacenter Unified Fabric. The three features of Fabric Extenders, Virtual Port Channel, and Unified Fabric are the main features organization use right away when they implement Cisco Nexus switches for their core upgrades. But there are even more features that are very helpful for connecting to disaster recover sites, integrating with the Cisco Unified Computing System, and improving network security within the switching system. 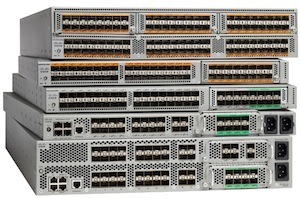 The Cisco Nexus switches truly are the best choice for an organization’s core network upgrade.